The merger of the Construction Forestry Mining and Energy Union (CFMEU), Australian Maritime Union (MUA) and Textile Clothing and Footwear Union of Australia (TCFUA) passed the Fair Work Commission hurdle on Tuesday. The three will now become one 144,000 strong union by the end of this month. in truth, the Commission has no grounds on which to call it differently. Its reaction to the Tuesday outcome is predictable, claiming that it will inflict “chaos” on Australian industry. Employer organisations argued that legal proceedings against alleged workplace and contempt of court proceedings should prevent the merger. 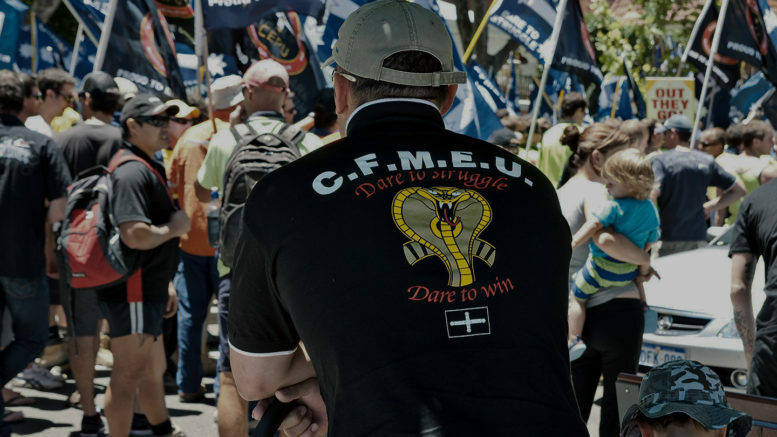 The CFMEU however, has been the victim under a unique law and process that treats the union and its members different from anyone else. It has been no secret that the intention has always been to destroy the union. Attempts have also been made to destroy the MUA. The Patrick battle of 1998 and the standoff at Victoria Terminal last year, were attempts to de-unionise the waterfront. Both unions have managed to survive, because their leadership and members have been determined not to go under, and because they have earned the support of a wide section of the broader community. The TCFUA is involved in an industry where jobs are disappearing, as production moves overseas. It traditionally employed a large proportion of women. The focus of the TCFUA is on protecting those jobs that remain in Australia. The reason for the broad base of support for these unions is the recognition that they have been at the head of protecting not only their members, but the whole workforce in terms of jobs, security and safety. There is no evidence that the existence of these unions has caused the loss of jobs and damaged the economy, no matter how loudly the government and employer organisations might proclaim it. In contrast, there is a body of evidence that suggests years of imposing the neoliberal agenda, has cost jobs and undermined the economy. Under this regime, manufacturing has nearly disappeared, wages and the Australian market have stagnated, the distribution of wealth has become more unjust, work has been casualised and poverty has increased, while well healed friends of the government have been laughing all the way to the bank. Neoliberalism is accompanied by antipathy towards unions, which are regarded as a barrier to the unfettered function of the market and the turning of the workforce into an economic input to be exploited by employers as they see fit. This is the reason why, so much attention is being paid to removing the influence of unionism from Australia. The merger of the three unions, will strengthen an important buffer against all this, and is therefore a positive development from the viewpoint of the interests most of Australia. Increased capacity to deliver results, may also help to bring about a reverse in years of declining membership, brought about, by ongoing economic decline, the associated loss of permanent work, and increased restrictions, imposed onion union activity. But it would be naive to assume that it is going to be smooth sailing from now on. The Turnbull government and the big business forces that stand behind it, have not given up their intentions. Given this prospect, it is understandable that the new union has already pledged to play its part in helping to bring down the government. It has no other choice. And millions of Australians will see this as a good thing. Be the first to comment on "Union merger scares the hell out of the Turnbull government and its mates and encourages working Australians"